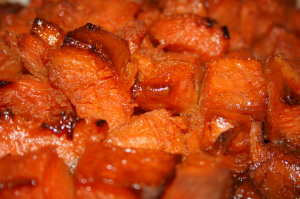 Candied Sweet Potato Recipe or Candied Yams Recipe? The question really is: Which potato should I choose? They are equally as good in these recipes. It is just a matter your preference or what is easy to buy in your area. We at Mamas Best have been making this for years. It is one of those things that once you make it. Your guest will be requesting it year after year. 5 pounds of sweet potatoes or yams. Wrap potatoes in aluminum foil then bake in a preheated oven at 400 degree for 30 minutes until tender. Let cool then pull off peels. Cut into bite size chucks. But them into a 9x13x2inch pan or 4 quarts. In a large sauce pan melt butter then add dark brown sugar, orange juice, ginger, cinnamon, salt,and allspice. Bring to a boil and mix until brown sugar is dissolved. Mix in baking soda into hot mixture when it swell then pour it evenly over potatoes. Bake in a preheated oven at 350 degrees for 30 minutes an serve. Throw some marshmellow and bake to top. Add walnuts, pecans, raisen or other dried fruit. And instead of orange juice add Brandy or Jack Daniels instead.